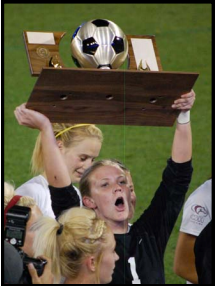 Alyssa Gillmore was one of Dynasty Goalkeeping’s very first students, attending camp in our first year of existence, summer 2006. 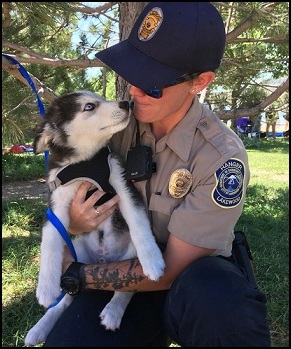 “Gilly” as she was more commonly known went on to play collegiately at Arizona State University and now works as a Colorado State Park Ranger. Now that’s a COOL job! What year(s) did you attend Dynasty Goalkeeping? What drew you to Dynasty? I attended Dynasty Goalkeeping in 2006 in the inaugural year of the camp, returned for a few summers, and also assisted as a staff coach in 2010 & 2011. I actually did not discover the camp, my goalkeeping coach at the time recommended it for me and said that it would be a great learning opportunity for me, so I signed up. The biggest thing that stood out about my Dynasty experience was how talented other goalkeepers were from other states. It is easy to get very complacent playing the same teams during league (especially pre ECNL and pre Development Academy) where you can easily compare where you stand amongst them. The first day at Dynasty I quickly realized that I was a little fish in a big pond. Of course that was terrifying at first, however, it truly pushed me to work harder on my weaknesses to become better. As a player was the biggest way that Dynasty helped me to grow. I learned that if I truly wanted to compete and be looked at by colleges I needed to work even harder. 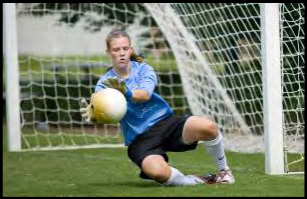 At camp I could size myself up against other gks my age, and even those who were older and already in college, and see what level I needed to be at a minimum and what I needed to do to surpass it. As a person Dynasty helped me to branch out of my comfort zone. Obviously you are put into situations that you have to push yourself through and it teaches you what you truly are made of. It is in those moments when you want to quit that you learn you are tougher than you think and you can do a lot more than you give yourself credit for. It also showed me that it was okay not to be the best and it was okay to be weak in certain areas. By being able to acknowledge that I was able to really look at and assess what I needed to do to improve. Humility was my best friend while I was there and I learned that failure sometimes is the best way to success. This is truly a tough one to answer. I would say my favorite memories revolve around conversations and time spent with other girls at the camp. One girl in particular I recall lecturing me one day on the importance of recycling yet then proceeded to state how she wanted to drive a Hummer. Moments like those were priceless. I also really enjoyed having to do a synchronized swimming routine with other students and playing “Catch Phrase” until it was time to go to bed. Of course another favorite memory is the pure excitement that Tracy (aka “Whompster”) would get when you made an epic save — nothing beats that feeling. As I mentioned before Dynasty really helped to pinpoint the areas that I needed to work on. My biggest area to improve was gaining more confidence on crosses. The constant reps that you would get at camp as well as the drills that you could take home really made an impact. I also learned a lot about how the whole recruiting process worked in general from signing, to what schools to look at and why, and even travel considerations. The different weight lifting programs we did at camp plus the leg circuits Tracy gave us (as much pain as they caused me) were also incredibly beneficial in getting where I needed to be size wise to protect myself against girls that were seniors or red shirt seniors that were much stronger and faster than me. You grew up playing soccer in Evergreen, CO. I played for Real Colorado based out of Highlands Ranch, so that meant a lot of driving to and from practice. Nope, just soccer for me in HS. What compelled you to choose to attend Arizona State? One factor was that I knew the goalkeeping coach there and I knew I liked his coaching style. I also wanted to attend a bigger school out of state so I didn’t have to feel like I was still in high school. ASU was close enough to home that I could be back in an hour and a half on a plane and about 12 hours via driving. My biggest challenge on the athletic side, I’ll be completely honest, is how burnt out you can get and how quickly it can happen. It really feels like a full time job and it can consume you if you let it. It was also a challenge for me to go from a coach in high school that truly cared about the players and made it fun to a college coach that wasn’t as caring. Sadly for me college took a lot of fun out of the game and by my senior year I was completely burnt out of the sport in general. That was a true challenge for me was to see something I loved so much turn into something I resented. Academically I didn’t struggle too much in college, but you absolutely have to stay organized and take advantage of study hall hours. It could get tricky to make sure everything is done in time before you travel for away games but once you get in a routine and really communicate with your instructors it’s not too bad. My favorite college soccer highlight was my very first game I played. Going into college I was suppose to be the back up to a red shirt senior so I would have a full year to prepare to be the starter when she left. Right before PAC 10 (now PAC 12) league games started she tore her ACL and I became the starter. When I say right before league play I literally mean two days before, and not to mention our first games were UCLA and USC, on the road. I can still remember the weekend like it was yesterday. The top moment from the UCLA game was plucking a cross right off the head of Sydney Leroux (currently plays professionally with the NWSL Orlando Pride and with the US WNT) and then the next day tying the school record for most saves in a game against USC. Tell us more about your current job down as a Colorado Park Ranger. How did you end up in this position? Honestly when I was in college the title of Park Ranger just sounded so cool to me. Growing up in Colorado I spent much, if not all, of my time outdoors and when I learned that there was a job for that I was sold. It was tough to get into the field in Arizona so I decided to move back to Colorado and I applied for anything and everything I could just to get my foot in the door. What positions did you hold prior to becoming a ranger? Before becoming a park ranger I worked a little in the resort and hotel industry in Arizona and I also worked a few years for the Reebok Spartan Races traveling and setting them up. Before getting hired on as a full time park ranger I also worked a few seasons at various parks. How does one become qualified to become a park ranger? What training/education is required? 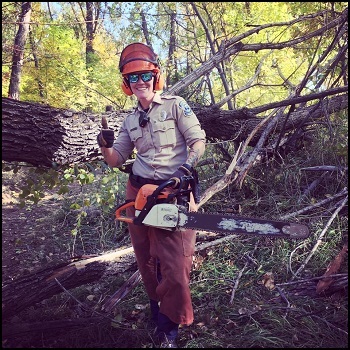 To become a full time employee for the state Colorado Parks and Wildlife (CPW) there is quite a process you have to go through. 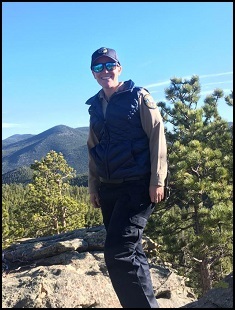 It definitely helps if you work as a seasonal ranger to start, meaning you are not armed but you are still responsible for upholding the rules and regulations of the park and ensuring public safety. In order to become a full time ranger you have to apply in April, you have a month to get your application in, once the deadline passes you have to wait a full year to apply again. If you are accepted you have to complete a series of tests over the next five months. If you pass one test you move on, if you fail one test you’re out of the application process. The tests were a physical test, a written test, series of oral board exams, polygraph test, psychological test, and then a final panel interview with the heads of the agency. In order to even apply you needed a degree in natural resource management as well. If you get the conditional offer you then enter the police academy which is about five months and then you enter what is called ranger skills training. So basically committing to a full year of nothing but law enforcement training. What are your daily job responsibilities? My main responsibility is ensuring public safety and protecting the resources. There is a good amount of law enforcement, but I also get to build new hiking trails, talk to some really interesting hikers and campers out on the trails, manage a volunteer program, go ATVing, snowmobiling, boating…so lots of fun stuff! What challenges are you currently facing? I am currently in the police academy so that is the biggest challenge. It can be tough learning from city cops what to do (and how it applies to what we face out in the field), but you have to keep the bigger picture in mind and remember that you are getting paid to do what you love. What do you enjoy about this opportunity? What excites you about it? I honestly love how much potential this job has for me. It truly challenges me and makes me think outside of the box to solve problems. I really feel like I can make a difference and leave my mark not only with the agency, but on my home state. Best part of your job? The best part about my job is being able to build new trails and go out hiking with a chainsaw to clear downed trees. There is so much variety and I absolutely love that no day is the same. What is the goal of the state park system in Colorado? The major goal of the state park system in Colorado is to preserve the resources for future generations to enjoy and to pass down to their kids one day. 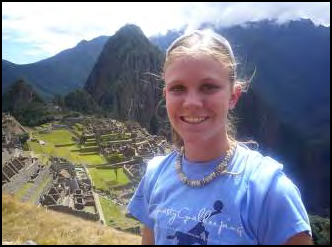 I know in high school you traveled to Machu Picchu, have you traveled anywhere else exotic? Where else have you traveled for work (or pleasure) besides Colorado? Favorite experience? In college we had the opportunity to travel to Germany to play some of their professional teams which was an amazing experience. 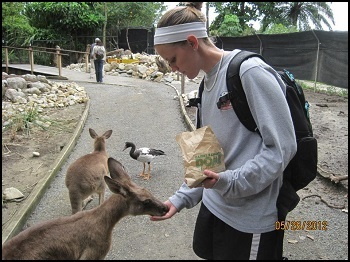 I also studied abroad in Australia for a semester in college which I would have to say was my favorite. I got to snorkel at the Great Barrier Reef, hold a wallaby, eat kangaroo, and see a show at the Sydney Opera House. What life perspective have you gained through your experiences thus far? Future plans? Goals? Career aspirations? I would say I have learned to really strive to always keep the bigger picture in mind. It can be tough some days when it is easy to get swept up in the daily grind and day to day routine, but I have learned to really look at why I am doing something and to always remember the why. My future plans are to really grow and see how far I can get with the agency that I am with. My personal goals would be to be the best aunt I can be to my brother’s new baby (they are expecting soon!) and to always be there for my family in times of need. As far as my career I really want to leave my mark in a big way. I want to either be a part of opening a new park or starting a program that really makes an impact such as a volunteer program or a trails program. I have yet to have a job that has been more difficult than college soccer was, or a boss that was as upfront as my college coach was. It is actually amazing to see how much my soccer career truly did prepare me. Even now in the police academy the “stressful situations” that other people panic about do not faze me because I have had much worse. Even being yelled at by State Patrol drill sergeants (or similar) doesn’t bother me because I’ve been exposed to similar situations throughout the demands that coaches put on me in college. I won’t lie it was difficult at first after soccer ended to find myself again. For so long I had always associated my identity with soccer and I felt a bit lost without it at first. Don’t let that scare you, really remember what you love in life and go out and pursue that. Never make a decision for someone else. Do not pick your school based on who you think wants you to go there or what other people are telling you. Absolutely listen to their advice, but at the end of the day you make the decision for you. If you want a small school, go to a small school, if you want to play to just have fun play D2 or D3. Don’t get caught up in the image of playing D1 or going to some big fancy school. Truly look at what their academics have to offer because at the end of the day you more than likely will not be playing soccer 10 years after college is over. I would hope that each and every one of you find your dream career like I have and can find a new passion to pour your efforts into just like you have with soccer. Always continue to challenge yourself and set new goals to reach. Keep the bigger picture in mind and think if you’re setting yourself up to achieve those goals later on in life. I know it might seem like soccer is everything and is life at the moment, trust me I was in your shoes, but at some point it’ll switch more from a career to a hobby that you do every now and then with friends. Make sure you know what will happen after that and try to prepare yourself for that before college has even started. Also, enjoy the high school moments as long as you can because they truly were some of the best moments that I had. College in itself is not too scary, so don’t get too worried about that. You know you’re a smart individual otherwise you wouldn’t even be considering colleges. Truly hold your support system close, whoever that may be and lean on them when times get tough. I also advise to make as many friends off of the team as possible. While I loved my teammates it was great to have people to go hang out with that knew nothing about soccer to get a little break from it. The biggest advice I have though is to HAVE FUN! The second something isn’t fun anymore… don’t do it. You’re happiness is always the main priority and never forget that.